After graduating from Indiana University South Bend I moved away for 10 years. When I moved back I wanted to start a record store and didn’t know there was one already here. When I found the one that was here it was like that scene from “Wayne’s World” where he’s looking at a Fender guitar in the guitar shop and he’s like, “One day that will be mine.” That was me with Ignition Music Garage, haha! I was born in Elkhart but grew up along Country Road 22. I went to Middlebury schools and Church of the Brethren here in Goshen. I went to IUSB and graduated in 2007. 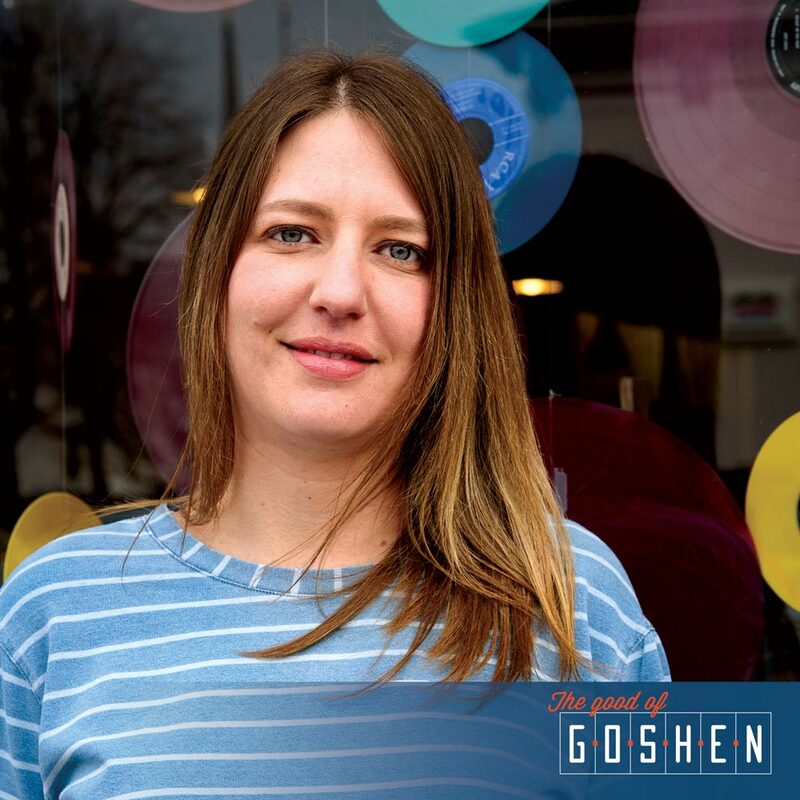 Goshen didn’t have a lot to offer at the time, so I left for Los Angeles for 10 years with my friend Sarah Emmons. I knew I’d come back to Goshen, though. While I was away I did art history, was a paralegal in Brooklyn for a while, and even did farmiculture for a while in Austin. I’ve collected vinyl every since I was a kid. I even ran a record store in college and did a radio show for Notre Dame for about five years. Now I run the retail side of things here at Ignition with my business partner Tim Hostetler, who runs the bookings. I’m here every day. There are lots of things to price, clean, and organize, so I’m never bored. I try to stay up to date on the records and do the buybacks for all used materials, which is almost a full-time job in itself. I tell people that if they have old record collections to please bring them in because we will buy them! I hate seeing them thrown away because there’s some really good stuff out there. I don’t think I could run this place alone, so I’m thankful for Tim! We’ve been really lucky because we get a lot of offers from people who want to play here. I’m really fortunate to have a business partner who helps with the research and who really knows the bands. Doing the shows here was the thing I was most excited to start being part of. If you want to start something in the music industry my advice is to be prepared to work really hard. Take the maximum number of hours you think you’ll be working and double it. You may also have to make personal sacrifices. I was working two jobs when I took this job and was putting in 18-hour days. Quitting that other job and pouring all my time in here was essential to Ignition’s success, even though that was hard because I loved my other job, too. We would like to make Ignition more sustainable. In order for that to happen, we need to buy the building and do some renovations. I’m hoping that in five years we can convince the owner to sell to us. But we do open mics and have hosted amazing acts like The Accidentals (who are coming back in June) and The Main Squeeze, so we’ve been really fortunate overall! Anyone interested in playing at Ignition should drop us a line!